and whisper for you to hear. especially your mum & dad. We were given one to hold. Guess how much I love you?. "Oh, I don't think I could guess that,"
his arms as wide as they could go.
" I love you as high as I can reach,"
"I love you as high as I can reach,"
the tree trunk with his feet. I could hop like that. be further than the sky. "That is very, very far." in your wonderful brothers Alex and Jack. in a big big world of love. and rescued Kayleigh on that day. and god she does know it!! Mummy, I wish I could stay. you'll come here too, mummy, someday. I'll love you mummy, dear. This invisible cord, from my child to me. It's stronger then any cord man could create. And though you are gone and you're not here with me. I'm thankful that God connects us this way. A mother and child... Death can't take it away! or twenty years or three. "Dear Lord, your will be done"
because Kayleigh came to love. is that an Angel song I hear? it was sending our Angel's love. for the treasures that you've had. in the beauty of the rainbow . They say it's a beautiful journey. Which will lead me straight to you. since you got your wings. with all your angel friends. but not as much as he loves you. and embrace her in my sleep. I am still her Mother. and the other left with you. 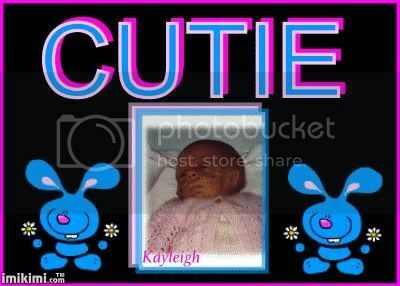 On Friday 1 October Kayleigh Siobhan Erceg was born weighing 1034 grams (2lb 4oz). I saw her very briefly before they whisked her away to the neonatal unit. It wasn't until the next day that I could get out of bed and go and visit her, by that time she had been put on a ventilator to help her breathe and was being given phototherapy to help treat jaundice. She had also been given chest x-rays and blood test and she had tubes and wires coming out of everywhere. A scan of her heart showed that a valve hadn't closed properly but the doctors were hopeful that it would fix itself. On Sunday 3 October the news wasn't good, Kayleigh's weight had dropped to 884grams (1lb 15oz) her colour had changed and her breathing was worse, it was a very worrying time but things did improve. 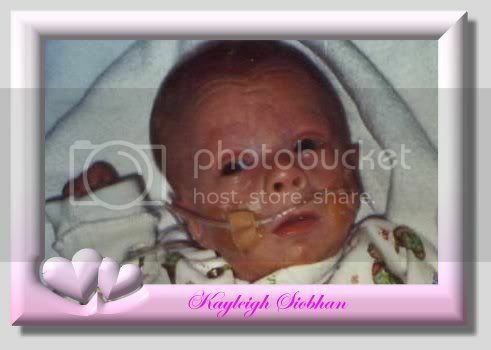 When Kayleigh was a week old she was taken off the ventilator and put onto CPAP, the phototherapy was also turned off. On 9 Ocotber, the day after she was taken off the ventilator, I was able to have my first cuddle. I didn't want to put her down. By Friday 15 October Kayleigh was taking 2 mils of milk every 2 hours through a tube. We got Kayleighs blood test results back and was told that she had a chromosome abnormality, ring chromozone 22. We had to go and see a genetic specialist on 10 November and we were told that she would grow up with severe mental disabilities, it was heart breaking but we still had a beautiful baby girl that needed us more than ever now. Kayleigh had good days and bad days over the next week but on 17 November she was put on low flow oxygen and taken off CPAP, she need to stay on oxygen because the ventilator had given her lung disease. She carried on doing well and on 21 November (7 weeks and 2 days old) she had her first bath, which she really enjoyed. After her bath she was put into a cot for the first time (instead of an incubator). It was so nice to be able to go in a pick her up when ever I wanted. On Tuesday 23 November we were able to transfer her to our local hospital in Whakatane which was great, I hadn't been home in 8 weeks. Everything was going great and the Doctors were talking about sending her home but then on 11 December she got pneumonia and ended up back in an incubator. She had to have an oxygen box (which is like a big helmet) put over her head. After a dose of anti-biotics she was on the mend again and was well enough to take home, on oxygen, on Christmas Eve. That was the best Christmas present anyone could ever get. A beautiful little princess forever in our hearts. A rose once grew where all could see it. through and it had spread wide. Now, you who deeply feel the loss, be comforted. is even greater nurtured by God's own loving care. 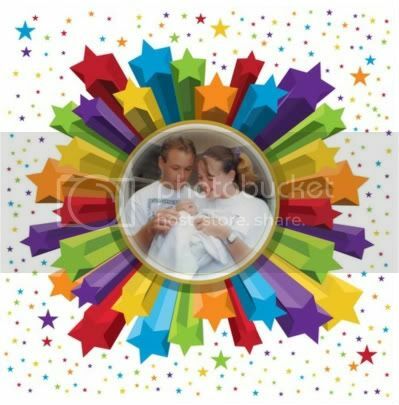 This memorial website was created by Tracy Erceg on 09/29/2005. Lou Bega - Mambo No.5 Kayleigh loved to kick her legs when this was playing. Celine Dione "Fly" such a beautiful song for all the babies gone before us. Kelli Georkge's Mom Lorraine lit a candle on 09/04/2018: "Jesus said,Let the little children come to me,do not hinder them for the kingdom of heaven belongs to such as these." Yolanda, Mom To Anna lit a candle on 01/14/2018: "May Kayleigh's Mummy & Nanny be blessed with only joyful, sweet memories today & may our Lord give them comfort & peace." Coral Mum To Angel DJ lit a candle on 01/14/2018: "Loved and Missed Everyday xxxxxx"
Yolanda, Mom To Anna lit a candle on 10/01/2017: "Remembering Kayleigh and her beloved family today. Knowing hugs, especially to her Mom." Jo-Ann Pacenta Lauren's Mom lit a candle on 10/01/2017: "Sending love to you & your family for your birthday dear Kayleigh. Hoping this is a gentle day for all who love & miss u"
Kelli George's Mom Lorraine lit a candle on 02/22/2017: "Stopping to light this candle in your memory precious angel." Yolanda, Mom To Anna lit a candle on 01/14/2017: "May our Lord bless Kayleigh's family with His love, joy, comfort & peace." Jo-Ann Pacenta Lauren's Mom lit a candle on 01/01/2017: "Wishing your family a blessed New Year filled with peace, joy and the comfort of precious memories." Jo-Ann Pacenta Lauren's Mom lit a candle on 10/02/2016: "Precious little Kayleigh, I'm sending hugs & prayers to heaven for your birthday..."
Jo-Ann Pacenta Lauren's Mom lit a candle on 07/24/2016: "Precious Kayleigh ~ you are loved and missed so very much. Thinking of you."